Check out what showed up Thursday. 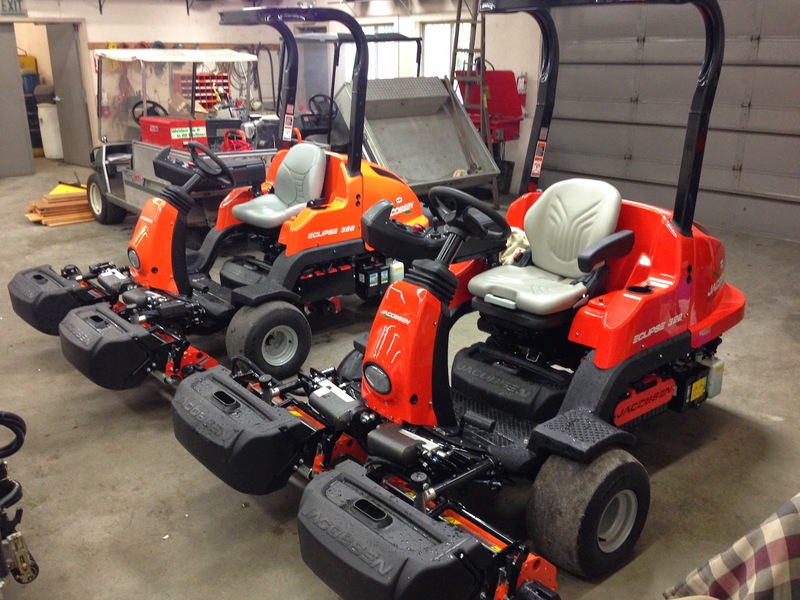 These are triplex mowers, and yes we will be using them on our greens from time to time. These two new units are replacing 20 year old machines that we phased out of our mowing programs several years ago. Why did we stop using the old triplexes? Simply put, they were inefficient and posed a risk to our putting greens. The old machines were slow. 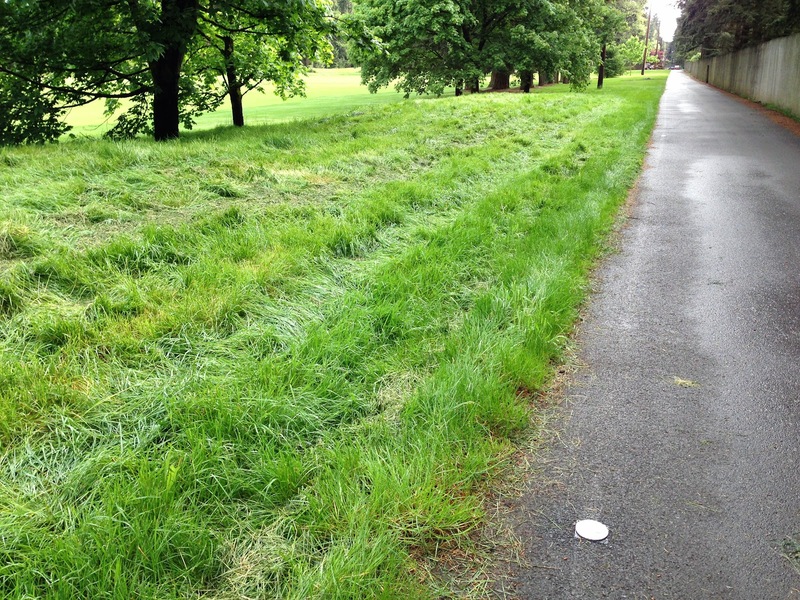 Yes they could mow a green faster than the walking mower, but transporting from green to green was slow so overall there wasn't a huge time savings. Most importantly is that the old machines used hydraulics to power propulsion and the cutting units. With hydraulics comes the potential for hydraulic leaks. I'll never forget the first Member Guest Invitational with myself as superintendent in 1999. We were mowing greens in the afternoon trying to get a blistering 10 on the stimpmeter (today our daily green speed average is about 11 on the stimpmeter) and a triplex blew a hydraulic line on the 18th green. Today, you can still see where that oil leak occurred since we had to cut out the dead, oil soaked grass and replace it with new sod. A lot has changed since those days. For one, we don't have to double cut or triple cut greens to get great green speed. We have learned how to grow grass with less fertilizer and we even have products that slow the growth of grass so all that mowing is no longer necessary to produce fast green speeds. Also we now have really neat greens rollers which help us get speed and smoothness. But that's not all that's changed. 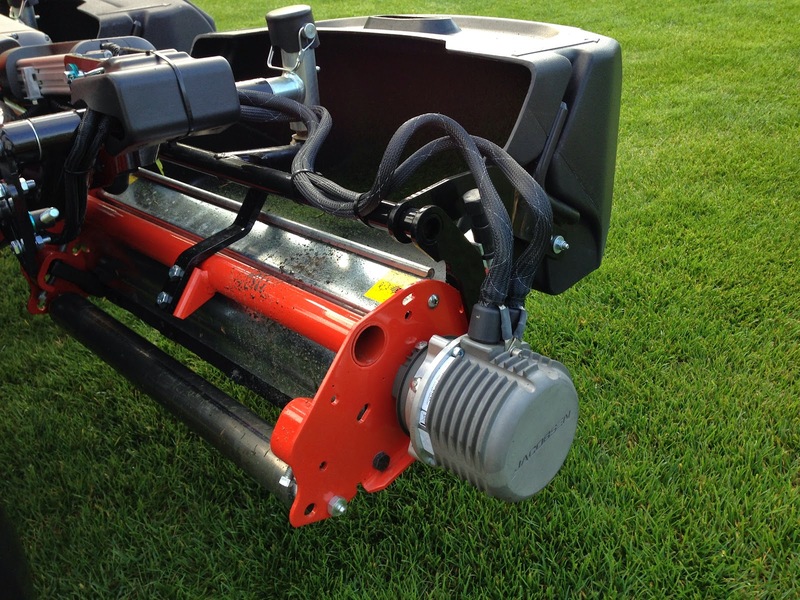 Mower manufactures have figured out how to eliminate hydraulics. Take a closer look at the cutting unit of our new machines. The two lines going into the reel motor are not hydraulic hoses, they are wires. This motor is powered by electricity. In fact all the motors on this machine are powered by electricity. The only oil in this machine is that which is in the engine. This machine has a small 2 cylinder diesel engine that drives the generator which creates the electricity to power all the motors. So really there is absolutely no fear that this machine will leak oil on the greens. It doesn't stop there, with the on-board computer, you can customize the mow speed and transport speed to maximize efficiency. With 15 blades per reel there isn't a machine out there that can mow any faster. Lastly, this baby transports from green to green super fast which really increases its overall productivity. I could go on about this machine but I'm sure you've heard enough to know these things are "game changers". With these as part of our fleet, we now have options. If we need to mow super fast, we can do that. 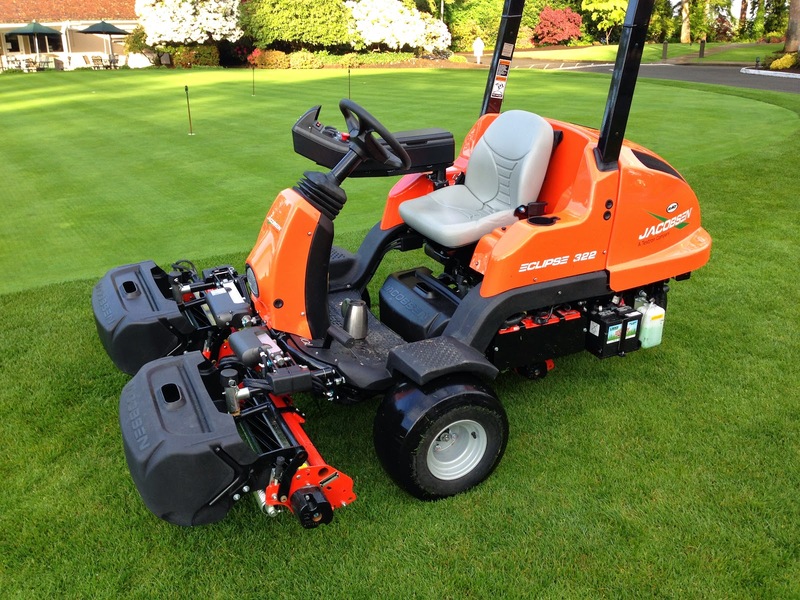 If for some reason a double cut is necessary for that special event, we can easily do that. Watch this video and see this amazing technology in action. Finally, if you're on the course this coming week (which you should be since the forecast is perfect), you will notice a couple new things. First, on the maintenance you'll see we're installing white dots which will replace the white line for the O.B. markers. Why? Well......the white line faded so there was certain times when it was difficult to see. Yes we could paint it more often but the road is a mile long so that isn't cheap or easy. Every time we paint the line, the area needs to be prepared with the pressure washer and like I said, the road is a mile long. Washing a mile long road is tough. The white dots are more permanent. This of course is just a trial so please check them out and let me know what you think. The other things you'll notice this week is the big dots on the fairways. 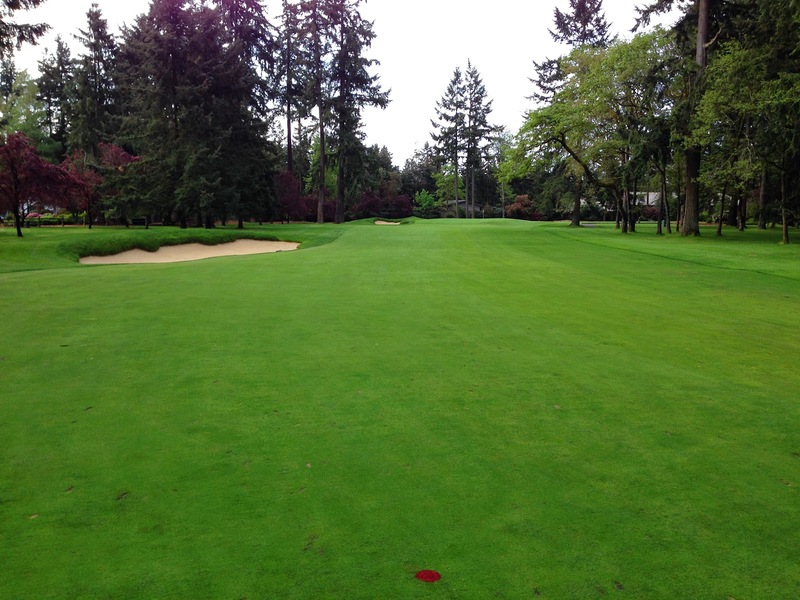 Each fairway will have one big green dot and one big red dot like you see in the picture below. These markers represent the Committee's suggested locations for the new family tees. Once the final location of these tees is decided, the painted dots will be replaced with permanent markers. Adding these two short courses will give the golf course a wider range of suitability for all those different types of golfers. Super young players or those that are just learning will like that they can reach the green in regulation. Older players that have lost some yardage off tee can now play a course that is easier to score on. When you score well, you're happier. It's all about making golf more fun and part of that is keeping a good pace of play. If you're playing a course that is too long for your ability, you are taking too many swings. The USGA and PGA have done a lot of research on the subject. They have found that the magic number for keeping golf fun is 90. If you can't break 90, you are not having enough fun to keep playing the game, AND you are taking too long which means your ruining the fun for the group following you. Be courteous to others on the course and play to an appropriate set of tees. Keep moving up to a shorter set of tees until you can consistently break 90. It's good for you and for those that are waiting on you. Click here to learn more about the family tee program.